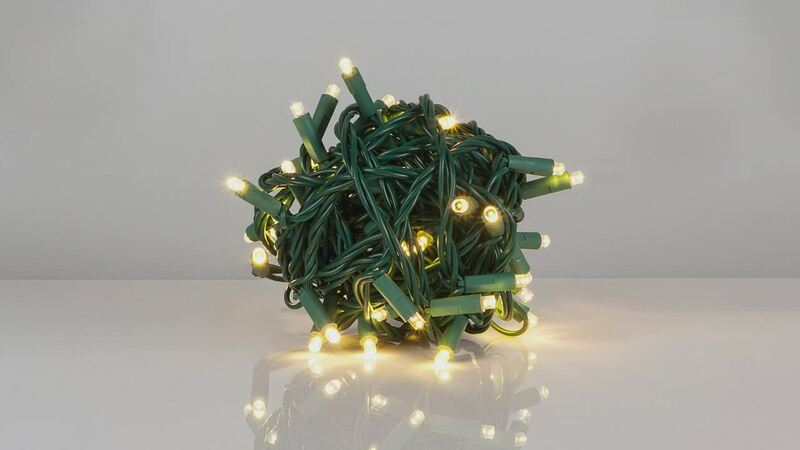 50 Warm White 5mm LED lights spaced 6" apart on green wire, 25.2' total length. I love these lights. I use them all year round. I use them in my summer plants on my front porch and in the winter for evergreen arrangements on my porch. The only time I don't use them is for Halloween and Thanksgiving, I use the orange ones then. They give my porch a cozy look and feel. Bought these to restring my Christmas tree last year. They are well made and the warm white is very natural looking. Planning to restring my outdoor garland and mini trees next. Arrived quickly. Actually have not used them yet, but I did plug them in and all the lights are working. I just got theses lights and have them in my shrubs. They are a nice warm color, just like incandescent. The lights have a warm glow to them, not blue or white. Exactly what I wanted. Thank you. Don't know why I didn't know about this type of lighting before. It's so much easier for wrapping branches. Quality products shipped in an easy to deploy format - balled up. This made stringing the lights along my fence line easy. The lighting is as described warm white. 2nd time buyer of this light. Very nice warm light and very reasonable when on sale. The lights came well packaged. They are very nice lights and work well.